The likely evacuation times based on changes to the above criteria. 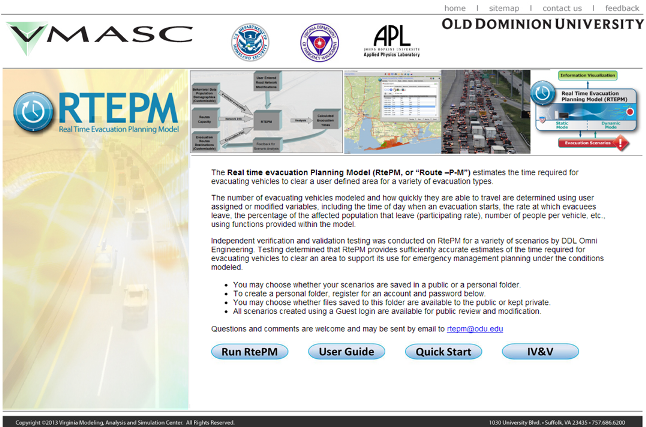 Comment: As previously noted on this site, following Katrina, researchers at the University of Minnesota developed evacuation planning software that has been available for past several years. It would be interesting to see a "run-off" between these two systems which evaluates appropriateness for various user communities. Superficial review suggests RtePM's would work best for individuals who want to run basic scenarios (i.e. Emergency Management types), while the University of Minnesota's Efficient Evacuation Route Planning and Emergency Management software would work best for individuals doing detailed planning (i.e. transportation department planners).